Hope you all had a lovely weekend. I went to some of my favorite cities in Veneto but more on that later. For now let’s talk about Breakfast in Italy. 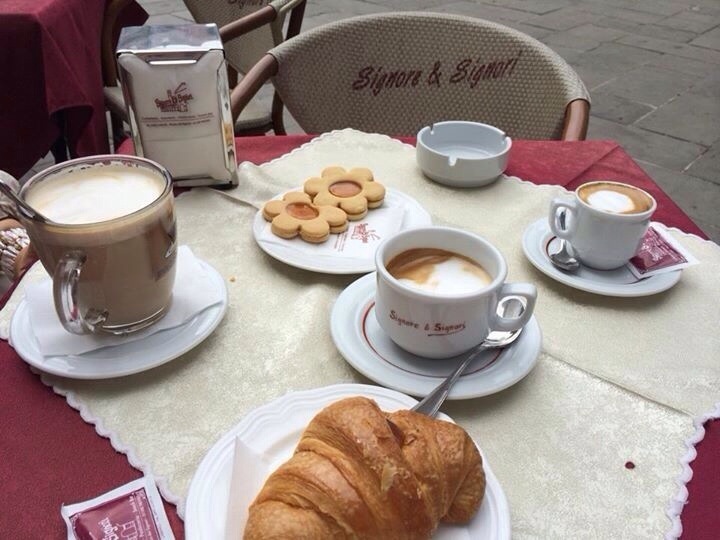 Breakfast in Italy usually consists of a brioche (croissant) and an espresso. There are an assortment of brioche. Brioche filled with chocolate, Nutella, apricot jam, cream, apple and plain with nothing inside (vuota). Don’t worry if you’re not a fan of having a shot of espresso as you can have any drink imaginable, café lungo, cappuccino, latte macchiato, macchiatone, ect.. Sometimes, if you’re lucky the barista will draw a design in your drink of choice. After all the best coffee is in Italy. Lastly, it’s quite normal to have our breakfast in a bar standing up ( no such thing as personal bubble in Italy) amongst others or if you’re not in a hurry sitting down also but it’s more common standing up. So, what would you order for breakfast in Italy? I always take a latte macchiato deca with a brioche with either cream or vuota. Depends on my mood, I guess. Haha! « Is there anything better?